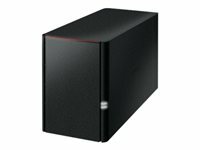 Buffalo LinkStation LS220DE Diskless 2-Bay Nas Drive combines an incredibly easy User Interface with the convenience, security and capacity of dual-bay, RAID-ready Network Attached Storage. The LS220D is affordable, fast, and primed for intensive data storage tasks. It's pre-configured and can even be set up via Smartphones with a new mobile optimized and intuitive interface. And with two hard drive bays users can choose RAID 0 for enhanced performance or RAID 1 for mirroring as part of a backup solution. The LS220D comes with Buffalo's free personal private cloud: wherever you are, all your data is accessible from any web browser or via Buffalo's WebAccess Apps for Android, iOS, or Windows Phone. And with Buffalo's Private Cloud solution users' data stays protected in the physical location of the device - not off-site in a third party's data center. Supports Apple Time Machine - for backup of multiple Mac computers. Buffalo LinkStation LS220D0202 with 2 x 1TB Hard Drives combines an incredibly easy User Interface with the convenience, security and capacity of dual-bay, RAID-ready Network Attached Storage. The LS220D is affordable, fast, and primed for intensive data storage tasks. It's pre-configured and can even be set up via Smartphones with a new mobile optimized and intuitive interface. And with two hard drive bays users can choose RAID 0 for enhanced performance or RAID 1 for mirroring as part of a backup solution. The LS220D comes with Buffalo's free personal private cloud: wherever you are, all your data is accessible from any web browser or via Buffalo's WebAccess Apps for Android, iOS, or Windows Phone. And with Buffalo's Private Cloud solution users' data stays protected in the physical location of the device - not off-site in a third party's data center. Provides simple and secure shared storage and backup for PCs and mobile devices on a home network. Allows users to backup content on up to five Windows PCs by using Award-winning NovaBACKUP®. Why Populated NAS? Buffalo offers free UPS drop-off service for all products under warranty. And for those who need even extra peace-of-mind – warranty extensions add one or two extra years’ full protection. Buffalo LinkStation LS220D0402 with 2 x 2TB Hard Drives combines an incredibly easy User Interface with the convenience, security and capacity of dual-bay, RAID-ready Network Attached Storage. The LS220D is affordable, fast, and primed for intensive data storage tasks. It's pre-configured and can even be set up via Smartphones with a new mobile optimized and intuitive interface. And with two hard drive bays users can choose RAID 0 for enhanced performance or RAID 1 for mirroring as part of a backup solution. The LS220D comes with Buffalo's free personal private cloud: wherever you are, all your data is accessible from any web browser or via Buffalo's WebAccess Apps for Android, iOS, or Windows Phone. And with Buffalo's Private Cloud solution users' data stays protected in the physical location of the device - not off-site in a third party's data centre. Buffalo LinkStation LS220D0602 with 2 x 3TB Hard Drives combines an incredibly easy User Interface with the convenience, security and capacity of dual-bay, RAID-ready Network Attached Storage. The LS220D is affordable, fast, and primed for intensive data storage tasks. It's pre-configured and can even be set up via Smartphones with a new mobile optimized and intuitive interface. And with two hard drive bays users can choose RAID 0 for enhanced performance or RAID 1 for mirroring as part of a backup solution. The LS220D comes with Buffalo's free personal private cloud: wherever you are, all your data is accessible from any web browser or via Buffalo's WebAccess Apps for Android, iOS, or Windows Phone. And with Buffalo's Private Cloud solution users' data stays protected in the physical location of the device - not off-site in a third party's data centre. Buffalo LinkStation LS220D0802 with 2 x 4TB Hard Drives combines an incredibly easy User Interface with the convenience, security and capacity of dual-bay, RAID-ready Network Attached Storage. The LS220D is affordable, fast, and primed for intensive data storage tasks. It's pre-configured and can even be set up via Smartphones with a new mobile optimized and intuitive interface. And with two hard drive bays users can choose RAID 0 for enhanced performance or RAID 1 for mirroring as part of a backup solution. The LS220D comes with Buffalo's free personal private cloud: wherever you are, all your data is accessible from any web browser or via Buffalo's WebAccess Apps for Android, iOS, or Windows Phone. And with Buffalo's Private Cloud solution users' data stays protected in the physical location of the device - not off-site in a third party's data centre.